For the next quarter of a century and more, Slessor would continue to pioneer missions in areas in which no white man had been able to survive. Her reputation as a peacemaker spread to outlying districts, and soon she was acting as a judge for the whole region. In 1892 she became the first vice-consul to Okoyong, a government position she held for many years. In that capacity she acted as a judge and presided over court cases involving disputes over land, debts, family matters, and the like. Her methods were unconventional by British standards (often refusing to act solely on the evidence before her if she personally was aware of other factors), but they were well suited to African society. 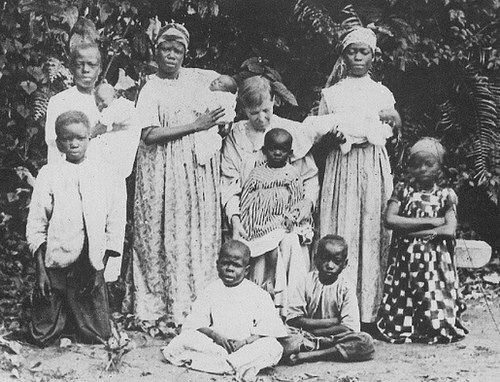 Slessor’s life as a pioneer missionary was a lonely one, but she occasionally traveled back to England or to Duke Town. During one of her sick leaves to the coast she met Charles Morrison, a missionary teacher who was much younger than she was. Their friendship grew and Slessor accepted his marriage proposal, with the provision that he would work with her in Okoyong. The marriage, however, never took place. His health did not even permit him to remain in Duke Town, and, for her, missionary service came before personal relationships. She was not really suited for marriage anyway. Her living habits and daily routine were so haphazard that she was probably better off by herself. Single women had tried to live with her, but usually without success. She was careless about hygiene, and her mud huts were infested with roaches, rats, and ants. Meals, school hours, and church services were irregular— all much more suited to Africans than to time-oriented Europeans. Clothing, too, was a matter of little concern for her. She soon discovered that the modest tightly fitted long dresses of Victorian England were not suited to life in an African rain forest. Instead, she wore simple cotton garments. Although she was highly respected as a judge and civic leader, she reported few conversions. She viewed her work as preparatory and was not unduly anxious about her lack of converts. She organized schools, taught practical skills, and established trade routes, all in preparation for others to follow. In 1903, near the end of her term at Okoyong, the first baptism service was held (with seven of the eleven children baptized being her own), and a church was organized with seven charter members. In 1904, at the age of fifty-five, she moved on from Okoyong with her seven children to do pioneer work in Itu and other remote areas. Here she encountered great success with the Ibo people. Janie, her oldest adopted daughter, was now a valuable assistant in the work, and another woman missionary was able to take over the work at Okoyong. For the remaining decade of her life, she continued in this work pioneer work while others followed behind her— their ministry made easier by her pioneering efforts. In 1915, nearly forty years after coming to Africa, she died at the age of sixty-six in her mud hut. Today she continues to be remembered in Nigeria as the great Mother Slessor. In measuring the woman’s power, you have evidently forgotten to take into account the power of the woman’s God. I shall go on. Lord, the task is impossible for me, but not for Thee. Lead the way and I will follow. Christ sent me to preach the Gospel and He will look after the results. It would be worthwhile to die, if thereby a soul could be born again. Christ never was in a hurry. There was no rushing forward, no anticipating, no fretting over what might be. Each day’s duties were done as each day brought them, and the rest was left with God. Oh Lord, I thank Thee that I can bring these people the Word. But Lord, there are other villages where no white man has gone. They need Jesus, too. Help me to reach them. Blessed is the man and woman who is able to serve cheerfully in the second rank. It is a big test. Prayer is the greatest power God has put into our hands for service. Praying is harder than doing– at least I find it so– but the dynamic lies that way to advance the Kingdom. If you are inclined to pray for a missionary, do it at once, wherever you are. Psalm 28:7a — The Lord is my strength and my shield; my heart trusts in him, and he helps me. Psalm 118:7a — The Lord is with me; he is my helper. O Lord, bestow thy grace upon all missionaries, that by them Christ may be lifted up in every land and all people drawn to him. In times of loneliness and weariness cheer them with thy presence; in disappointment give them patience; in the press of daily obligations keep their spirits fresh; in difficulties and dangers uphold and protect them; in success keep them humble of heart; in failure strengthen them to persevere. Make them to be joyful in spirit, radiant in life, steadfast in faith, zealous in service, and at all times deepen in them the sense of dependence upon thee and give them peace in thy service; through Jesus Christ our Lord. Amen.